We know that our Population X is 653 individuals. Of this population 104 have floppy ears (Xf). We know that p (short) is dominant over q (floppy). To find the frequency of each genotype we divide the total population by each genotypes' population. Deoxyribonucleic Acid is the meaning of it. It is a nucleic acid that is the carrier of genetic information. DNA are the letters of deoxyribonucleic acid. All life on earth uses this nucleic acid as the genetic code. A nucleic acid is a polynucleotide. A polynucleotide consists of three basic units: a phosphate group, a 5 carbon sugar (pentose), and a nitrogenous base. The five carbon sugar is deoxyribose. Since a polynucleotide chain, the phosphate and deoxyribose units are repetitive, the variation is provided by the nitrogenous bases. There are four bases: adenine, guanine, cytosine, and thymine. Both adenine and guanine are purines which have a double ring structure. Cytosine and thymine are pyramidines which consist of a single ring structure. The DNA molecule is double helix, a spiral shaped ladder. The upright or backbone of the ladder is made of alternating pentose and phosphate groups held together by covalent bonds. The rungs or steps of the ladder consist of the bases. These bases are joined to the pentose sugars with covalent bonds. Adenine pairs with thymine using two hydrogen bonds and cytosine pairs with guanine using three hydrogen. The genetic code is determined by the linear sequence of the bases. For example the sequence of adenine guanine thymine does not carry the same message as guanine thymine adenine. The code is arranged in triplet form which codes for RNA which in turn codes for amino acids which form the basis of proteins. Alleles are alternatives of one gene. Alleles are alternatives of one gene. For example brown hair or blonde hair or brown eyes and blue eyes. These are the same gene but just differ in how they are expressed. Some alleles are dominate or recessive to each other. The blue eye allele is recessive to the brown eye allele. For a person to have blue eyes, they must have two blue eye alleles. A brown eyed person has either one allele for brown eyes or two. They can carry the blue eye but it is not expressed. Other alleles are more complex. Some are co-dominate. The best example of this is the ABO blood type. A and B are co-dominate and O is recessive. In the image above, each letter stands for an allele of one gene. A is the dominate allele of the gene and a is the recessive allele of the gene. It doesn't matter how they are written, AA, Aa, or aa are all possible expressions of one gene. You would get one from your father and one from your mother. If these stood for eye color, a person with BB (brown eyes) would have two copies of the dominate gene and have brown eyes. He would not give any other color to this children except B (brown). A person with Bb (brown eyes) would show the dominate color but would have a recessive copy that would not show. This person could give B or b to his children. If the other parent also was Bb, it would be possible for a certain number of children to have blue eyes even though both parents have brown eyes. A person with bb (blue) would have the recessive eye color. They could only give b (blue) to his children. You can see that the probabilities are 3 to 1 (Brown to blue). These are by chance and the couple could have all Brown eyed children or 2:2 or all blue eyed children. How do nucleotides form DNA? DNA is just a pattern made up of four different nucleotides . Each nucleotide consists of a sugar (deoxyribose) in the middle of a phosphate group and a nitrogenous base. Nucleotides form a pair in a molecule of DNA where two adjacent bases form hydrogen bonds. The nitrogenous bases of the DNA always pair up in specific way, purine with pyrimidine (A with T, G with C), held together by weak hydrogen bonds. Strands of DNA are made by joining sugar and phosphate as backbone (by phosphodiester bonds): two such DNA strands run antiparallely forming the sides of a ladder and the paired bases act as the rungs of the ladder. The molecule appears as a twisted ladder and is called a double helix. Please read the links carefully to understand more. A nucleotide is a monomer (subunit) of a nucleic acid. The genetic information of a cell is stored in molecules of deoxyribonucleic acid (DNA). DNA is a polymer of nucleotides, that is, DNA is composed of a long strand of individual nucleotides. Since a polymer of nucleotides is DNA, you can look at this the other way by noting than a nucleotide is a monomer of DNA. A DNA nucleotide consists of three parts—a nitrogen base, a five-carbon sugar called deoxyribose, and a phosphate group. There are four different DNA nucleotides, each with one of the four nitrogen bases (adenine, thymine, cytosine, and guanine). The first letter of each of these four bases is often used to symbolize the respective nucleotide (A for adenine nucleotide, for example). Two strands of nucleotides, paired by weak hydrogen bonds between the bases, form a double-stranded DNA molecule. However, nucleotides are not present in just DNA. A nucleotide is really just a monomer of any nucleic acid, a category that also includes RNA (ribonucleic acid). The sugar in the nucleotides that make an RNA molecule is ribose, not deoxyribose as it is in DNA. The thymine nucleotide does not occur in RNA. It is replaced by uracil. When pairing of bases occurs in RNA, uracil (instead of thymine) pairs with adenine. RNA is usually single-stranded and does not form a double helix as does DNA. Lipids are naturally-occurring organic compounds that are readily soluble in nonpolar solvents but insoluble in polar solvents. The main biological functions of lipids include storing energy, signalling, and acting as structural components of cell membranes. 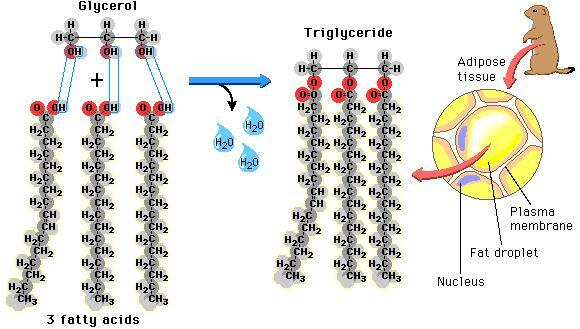 Since lipids are defined by their solubilities, they have varying structures, but they all have one thing in common: a polar, hydrophilic "head" and a nonpolar, hydrophobic, hydrocarbon "tail". Lipids include the following classes. Fats are esters of glycerol with long-chain fatty acids. The ester groups form the polar head of the molecule. In phospholipids, one of the fatty acids has been replaced by a phosphate group and a simple molecule such as choline. Sphingolipids are based on sphingosine rather than glycerol. Sphingomyelin is a typical example. Sterols have a tetracyclic hydrocarbon ring system with an attached hydrocarbon chain. Cholesterol is a typical example. Vitamin A (retinol) is a typical example. The OH group is the polar head of the molecule. What are the steps involved in meiosis? In meiosis I there is prophase I, metaphase I, anaphase I, and telophase I and then in meiosis II there is prophase II, metaphase II, anaphase II, and telophase II. Prophase I in which a pair of homologous chromosomes line up and form a tetrad. This is the stage during which genetic recombination occurs. Metaphase I occurs, during which the homologous chromosomes line up opposite each other at the metaphase plate. The chromosomes orientate themselves randomly, thus homologous chromosomes are distributed randomly to daughter cells . In Anaphase I, homologous chromosomes move to opposite sides of the cells but sister chromatids remain together. Each cell now has 23 chromosomes. Telophase I in which the homologous chromosomes move to the poles and cytokinesis occurs. Two daughter cells are formed. Prophase II (note: there is no interphase as seen in mitosis) during which chromosomes start to move to the metaphase II plate. There is no replication. Next is metaphase II when the chromosomes align at the metaphase II plate. In anaphase II the sister chromatids separate from each other and move towards opposite poles. Lastly, in telophase II cytokinesis occurs again and four daughter cells are produced. Each of the four daughter cells has 23 chromosomes. How can there be 64 codon combinations but only 20 possible amino acids? Codons are three letter genetic words: and the language of genes use 4 letters (=nitrogenous bases). Hence 64 words are there in genetic dictionary, to represent 20 amino acids that the biological organisms use. And you must note that more than one codon may code for the same amino acid. This is referred to as degeneracy of the code. For example, three amino acids are coded by any of six different codons, and that alone uses up 18 of the 64 combinations. Three of the codons are stop codons. They do not code for any amino acid. Instead, they act as signals to end the genetic message carried by messenger RNA . Here's a chart that gives the codon assignments for the amino acids. The word itself means "living together". Textbooks use the de Bary definition and this is: symbiosis = all species interactions. Some symbiotic relationships are obligate, meaning that both symbionts entirely depend on each other for survival and cannot live on their own. Symbiotic relationships include those associations in which one organism lives on another (ectosymbiosis), or where one partner lives inside the other (endosymbiosis). There is much more terminology when this is further divided into parasitic, commensal and mutualist relationships.